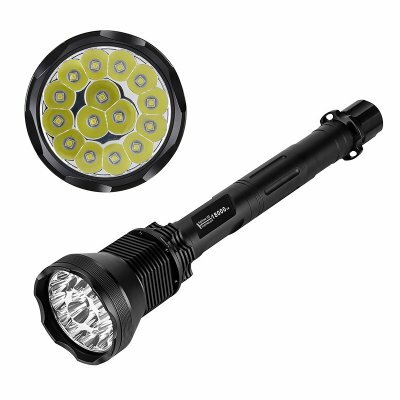 Successfully Added LED Flashlight - 18000 Lumen, Aluminum Alloy Body, 15x CREE XM-L T6 LEDs, 5 Light Modes, Reinforced Glass Lens to your Shopping Cart. One thing is certain; this massive LED flashlight is not for the weak ones among us. With its large size and weight of more than 1.3KG, this LED flashlight certainly catches your eye. Within its massive body, this LED light packs four 26650 batteries that bring along enough juice to get you through the longest of nights. When used at full power, this beauty produces up to a whopping 18000 lumens – enough to light up all that lies ahead. This has been made possible by its 15 top-end CREE XM-L T6 LEDs. With this LED flashlight at your side, you can be guaranteed that nothing will ever again stay hidden in the darkness. This 18000 lumens LED flashlight features 5 different lighting modes. Thanks to this, you’ll be able to efficiently use it in any type of situation. Among its 5 lighting modes is an SOS feature that allows you to signal people passing by. This makes your LED flashlight extremely useful to be used in emergency situations. The light itself has been crafted out of high-quality aluminum and comes with a reinforced glass lens. Therefore, you won’t have to worry about accidentally damaging your torch when using it the outdoors. With an LED lifespan of up to 100,000 hours, this flashlight will light up your life for years to come. This LED Flashlight comes with a 12 months warranty, brought to you by the leader in electronic devices as well as wholesale electronic gadgets..